Dusting myself off . . . This past March, my Grandfather passed away. He had lived a long life, filled with lots of mischief and memories. He had also survived lung cancer, kidney failure and multiple hospitalizations, so it wasn't a great surprise when he finally passed. I miss him, though. We were close and I learned a lot about life from the old man. The day before I was to fly back to the midwest for the funeral, my younger sister, Marie, called me. Grey was out of town on business and I needed to purchase a few items before the trip (tampons being one of them). The conversation started benignly, then she became quiet. Marie was well aware that Grey and I had been trying for over a year at that point and that I was hurting. She told me she had something to tell me, began to cry and told me she was pregnant. Apparently the birth control had failed and all of the sudden she found herself in a situation that was less than ideal. Somehow, I found the words to comfort her and assure her that, in that moment, everything would be alright. At the same time, I felt like my world was crumbling around me. 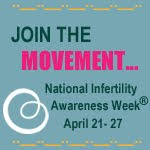 It still amazes me that infertility can turn one's world completely upside-down and inside out. Only a few years before, I would have been incredibly sympathetic and comforting. Even excited for the arrival of a new niece or nephew. But infertility colors everything. Instead of being excited, all of I could think of was why. Why is it someone on BIRTH CONTROL can get knock-up and I can't? Where is the father in this situation and why is he so lucky when he's only been in the picture for such a short time? Why her? Why not me? This inner dialogue is quickly followed by quilt and blame. I'm a bad sister, because I'm not being more supportive. I deserve this; I waited too long. Etc, etc. I've been reflecting on that conversation a lot this past week. Part of the reason is that two days ago my sister gave birth. The other reason is because in a very short time, I start IVF meds. In a way, I get a fresh start from these recent events. All the pressure to produce my parent's first grandchild is gone. In addition, all the responsibility of being "the first" is also lifted. But, like death, there is pain that comes with all of this. I'm still scared that IVF isn't going to work and that we'll find ourselves at Christmas with a BFN. But I'm also grieving the loss of the way I saw life. Like most midwestern girls, I attended a college that wasn't terribly close to home. Unlike my peers, instead of moving home and settling down, I relocated to another coast. I think everyone in my family secretly believed that it would simply be a matter of time before I moved home, taking on my role as the caregiver. Marrying Grey through the first wrench into those plans. Graduate school added another. Yet it was still believed that one day, I would see the light and start having babies. And it would be easy! Infertility has ripped that life from me. What once was a given is now gone. My children won't be the first and, if I am so lucky to become pregnant, it will be viewed in a negative light by them. Never-mind adoption. But also the need to rush home is gone too. In a weird way, it's like the shackles have been unlocked, freeing me from a supposed life. All the issues are now wide out in the open and for the first time, I have some decisions to make. Back in September, after IUI #3 failed and we were given the green light to pursue IVF, Grey and I decided it was time to start preparing ourselves for the roller-coaster of drugs and monitoring. We bought a bike rake, had the bikes tuned-up and Grey started biking to work almost everyday. I pulled out my running shoes and started jogging on a regular basis. In addition to the cardio, I decided to get serious about my mental anguish and started yoga. Every Sunday morning, while most families roll out of bed, dress in their Sunday best and head off to church, I carry my yoga mat to the local yoga studio and spend the next 1 1/2 hours rediscovering muscles I forgot I had. Though I may not think it while straining to do Warrior 3, I think I'm getting the better end of the deal. I love my yoga instructor. She has such a calm nature to her and is incredibly warm and welcoming. She knows that I'm preparing for IVF and has been incredible about helping me modify the postures so that I can use them throughout my cycle. In addition, she's also started having the class meditate on what we want out of life and modifying our thoughts in order to promote more well-being. And I've been completely okay with that, until today. "An adult is one who has lost the grace, the freshness, the innocence of a child, who is no longer capable of feeling pure joy, who makes everything complicated, who spreads suffering everywhere, who is afraid of being happy, and who, because it is easier to bear, has gone back to sleep. The wise man is a happy child." The whole idea is to find the joy in your life and to embrace it. Something I completely agree with. But here's the thing: my inner child is currently not a happy one. My inner child feels like she's been told that she can't play with the other kids because she's "weird." My inner child causes the other mothers to whisper and point in her direction. In short, my inner child is tired of being patient and is on the verge of throwing a temper-tantrum. What shocked me the most was that this imagine actually has been empowering. I spent the rest of class mentally conversing with this sad child, telling her I was sorry for the situation, that she was loved, that she wasn't alone and that things were going to change very soon. "But why is it taking so long!!!!" she wailed. Because if we don't prepare for December and things don't turn out the way we hope, we won't be strong enough to continue forward. Because December is the time that we'll be able to rest and focus our energy on IVF. My inner child still isn't convinced, though. She's still pessimistic about the outcome of all of this. And that's when it really hit me: I need to get this kid on board. Because without her, I'll just be self-sabotaging myself and I'm so tired of all the doubt. For me, introductions are like icebreakers: seem very simple in concept but incredibly hard to execute. My name is Cristy. I live in the Pacific Northwest. I love being outdoors, but am also addicted to sleeping in on Saturdays. I'm married to the love of my life, Grey, and have been happily married for 7 1/2 years. Two years ago, after many blissful years for of coupledom, we decided to toss the birth control and try for a baby. After all, it was suppose to be so easy; no woman in my family ever had trouble getting pregnant. Yet here we are, 2 years later and not a single BFP. Two years of hoping; two years of disappointment. After being diagnosed with unexplained infertility and 3 failed IUIs, we are preparing for IVF. IVF: those three letters bring so much hope and so much dread.